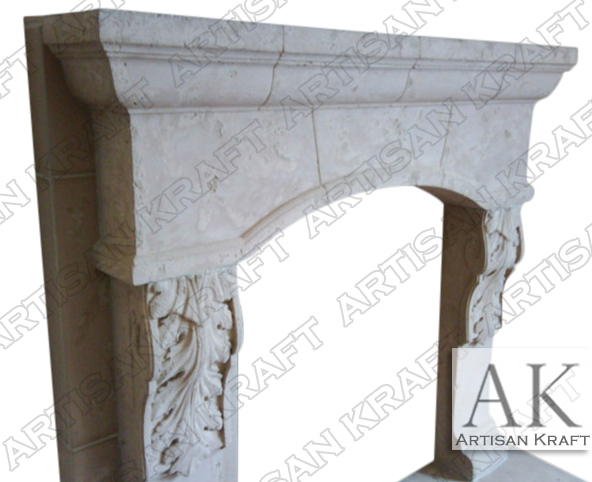 Scottsdale cast stone mantel is pictured in a textured cast stone. A style and cast that is very popular in Arizona where the Scottsdale gets its name from. Sedona, Arizona is a naturally wonderful place. This fireplace tries to bring out the natural beauty of the desert landscapes. This textured options is made to resemble travertine. Artisan Kraft offers many different finishes for the fireplaces. The decretive corbels and the arched frieze are the most prominent features of the Scottsdale. Stone: Precast, stone, limestone, sandstone, marble, travertine etc.